The banks, the post office, the stock market, schools – they're all closed today. Did you forget? It's a national holiday. Eleanora Fagan's birthday. Better known to you and me as Billie Holiday. 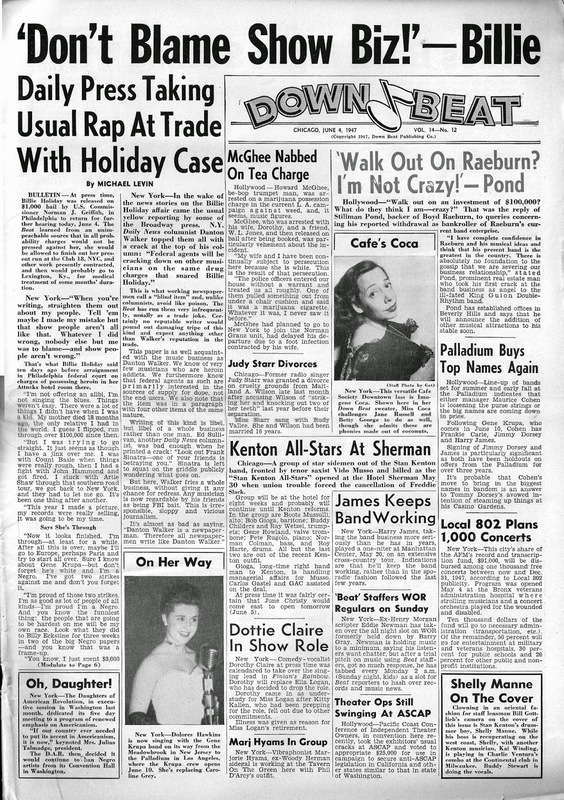 Well, for one thing, here's page 1 of the Down Beat that reported Billie's first big bust – the one that wound up sending her away for a year and lost her her cabaret card. It gives you a sense of what a tough cookie Miss Holiday was, and how magnanimous she was in her concern for her fellow musicians. They don't make them like that anymore! 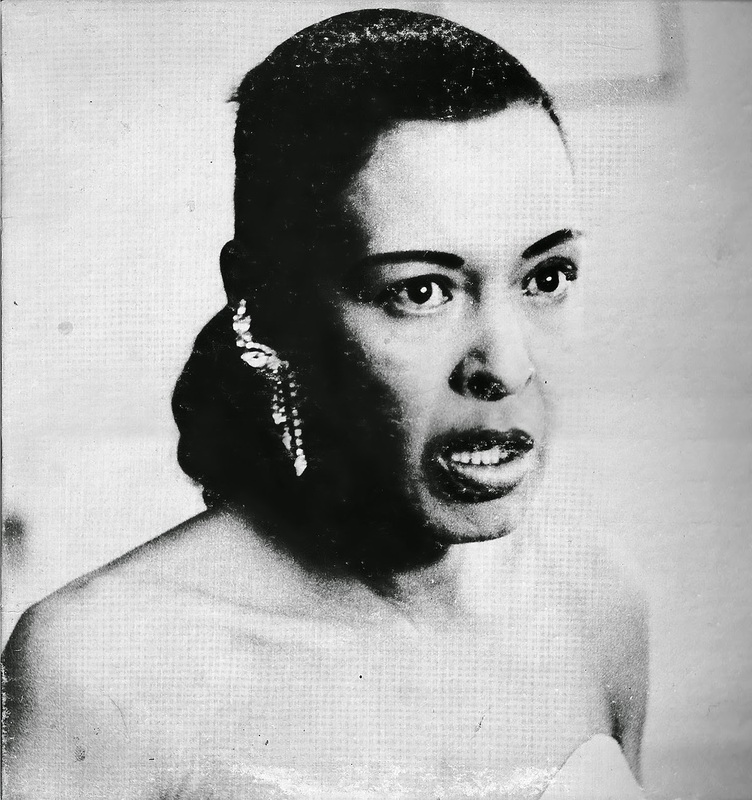 In poking around on the web, I noticed the the first ESP Billie Holiday release – the one with that "deer-in-the-headlights" cover – is hard to come by because Bernard Stollman had to withdraw it. 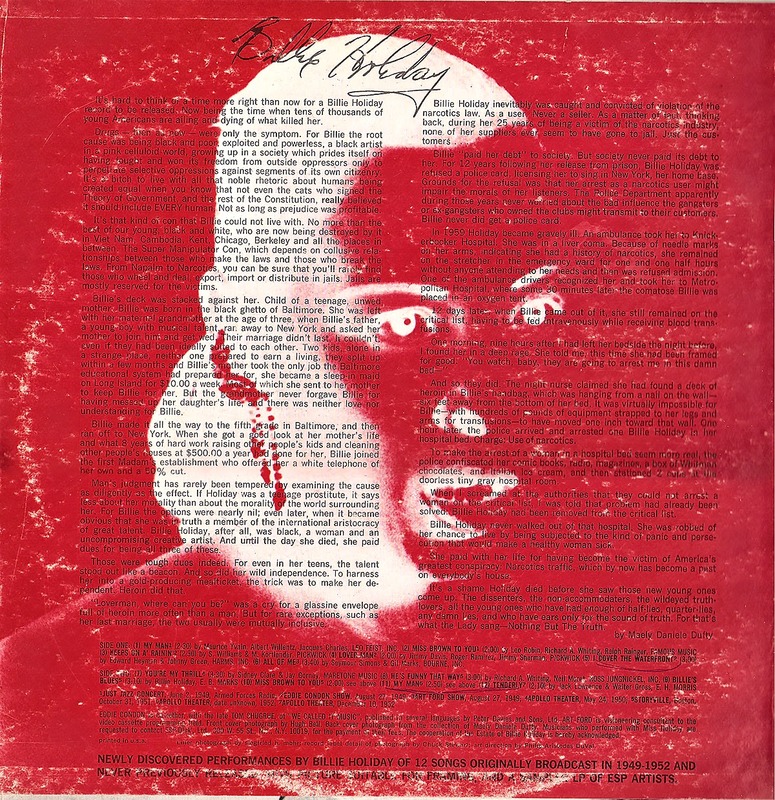 I guess the Billie Holiday Estate objected to the cover image (it's not hard to see why). The music on the album comes from Boris Rose's tapes, performances from 1949-52, and they are all excellent. So, you may have this recording, but you may not have the cover. To celebrate Lady Day's centennial, here's cover and contents, just as they were initially released back in 1972 or so. I bought this back in my college days, so there is a bit of surface noise (in addition to stuff that was inherently part of any ESP pressing). But I think you'll enjoy the performances regardless of a few pops and clicks. By the way, this is a rare legitimate Boris Rose release, one with song titles, credits, timings, the works. ESP must have insisted that he play it straight for once. As always, the files were ripped right from the precious vinyl. Enjoy, and happy 100th, Billie! Horace Henderson, p; Lips Page, tp; Eddie Condon(? ), g.
I sure enjoyed this and all your blog. It's a pleasure to find blog like this one that share the music for the sake of it (and my God, no passwords!). as a fledgling jazz lover I admire your work and your collection of course. Thanks a lot and keep up the good work. Glad to have you as a visitor, Jinete. What is this music for but to share, right? Gems tries to bring many recordings that have been lost over the years to fans who might never get to hear them otherwise. And many great artists, too. More to come! 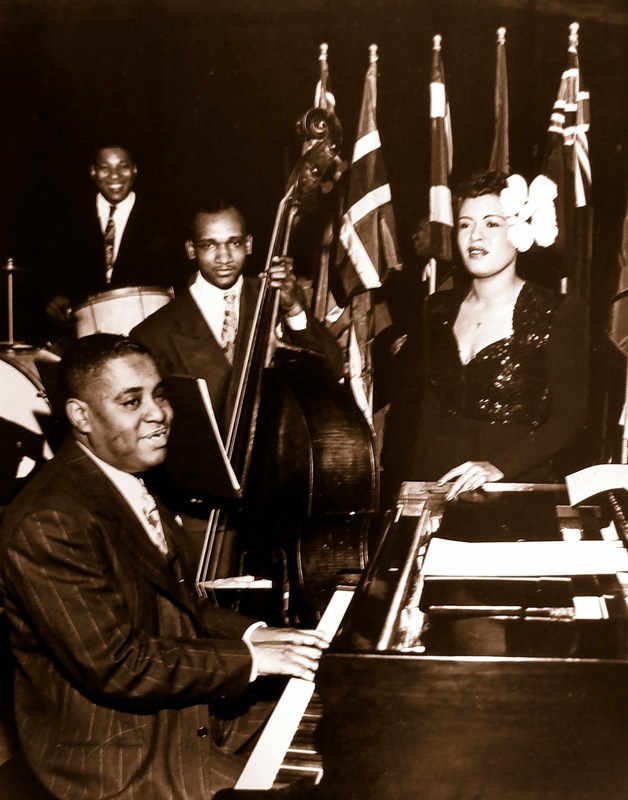 100 years Lady day! photo was not taken in England but taken on stage at the met in n.y.city on 18.01.1944 during the first Esquire jazz concert that we all love and know! Marcel! You're a font of info! Thanks for that clarification. My second guess, I hasten to add, was indeed the Esquire awards concert, due to the presence of Tatum, Pettiford and Catlett. I believe that was one of Oscar's first gigs in NYC -- not a bad place to start out. But how do we explain the Brit flags in the background? I confess they are what threw me off the Esquire attribution. Great share, David! I look forward to hearing this one soon. I'm sure you tuned in to the great Lady Day celebration at WKCR. It was a wonderful tribute for her 100th anniversary of her birth. Did you do anything on your show in honor of her? Regardless, this share is a fine tribute to her on her birthday. Thank you for sharing and for running such a fantastic and unique blog. Thanks for the kind words, JC. Unfortunately, I missed KCR's tribute. I'm sure Brother Schaap offered up some fascinating rarities in addition to insightful (and long-winded!) commentary. I did do a tribute to Billie on my show (which you can hear via the link on the right of this page), featuring her 1956 Carnegie Hall concert with narration by Gilbert Millstein. Weird but interesting. This ESP download has Billie working with Horace Henderson. Who knew they collaborated? I'll have to check out your tribute show. Thank you for the heads-up on where to find it. Yes, I had no idea that Billie and Horace Henderson collaborated. I thought I heard his name a time or two during the KCR broadcasts, but I kept telling myself that I couldn't be hearing that right. Now, I have proof that they did play together. Fascinating!